Eight actions I’ve taken that have helped me on the road to recovery after injury. Claire Harris, Helping people thrive through injury. Passionate about innovation, especially in health, agriculture and environment. Eight actions I’ve taken that helped me on the road to recovery after injury. Today, 365 days ago, feels a million years ago. It was time for my knee reconstruction surgery. I’d worked through a roller coaster nine months of shock, pain, disability (having to teach my brain to reconnect with my leg after nine weeks non-weight-bearing), frustration and overwhelm. But the day had come, my leg was strong enough and moving well enough, and my surgeon was ready to unleash his scalpel. Waking up that morning, I felt very nervous. I was not looking forward to the hospital visit itself nor the impending pain. But I was also resolved. I saw the surgery as a signpost to getting into the next phase of recovery with the potential of a stronger knee. Although I’d been through the phases of injury recovery and accepted the process of change and growth once before, I found myself questioning: Could I really do this again? After I came out of surgery the pain was unbearable. The worst I had ever felt. I was crying with pain. 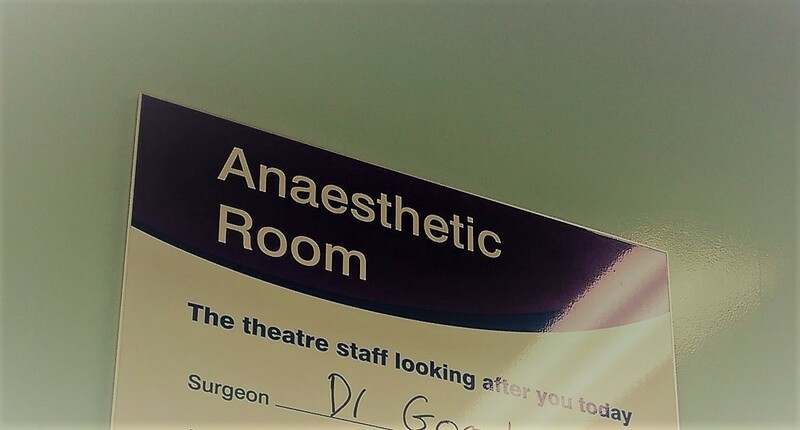 The anaesthetic as well as learning my surgery hadn’t quite gone to plan, had knocked all my energy out of me. When we got home I had to climb three flights of stairs on my bottom because I didn’t have the energy and was in too much pain to use my crutches. Photo: After surgery with the surgeon beside me. I don’t really remember this photo being taken, even though I requested it… Clearly knocked around by the strong anaesthetic. The first week was a blur of pain and the basics: food, sleep, toilet. Repeat. Two weeks later I got my stitches out and the surgeon said I could start to wean myself off the crutches. It took about seven weeks and I limped for many weeks more. Two years ago I was terrified of needles. On surgery day I didn’t faint after the needle and tube went in to my hand. Two weeks later, I could watch the stitches get cut. I’ve gotten so much better with my fear and I see this as a great triumph. Photo: Receiving dry needling around my knee (and also in my foot). I’ve learned a lot about pain and that memories and emotions throughout my life have fed into my psychological relationship with pain. This has resulted in me being more sensitive to pain and more susceptible to persistent pain. I’ve researched this and talked to experts to understand pain a lot more. I do remember once — finding the pain so unbearable and constant — thanking my knee for sending signals to my brain and then telling it ‘that is enough!’. The pain actually decreased. Before my knee injury there is no way that I could do a chin-up. I used to train at the gym, sure, and have trained for decades. But I can honestly say I didn’t push myself that much and didn’t get close to my potential. For many months, I felt like I was inching slowly forward, like a snail over gravel. My physical rehabilitation continued — exhausting rep after exhausting rep — as did the wrestle to feel happy and strong in my body again. Having to regrow almost a whole leg’s worth of muscle puts things into perspective. My knee will maybe not be the same (it still feels quite weird, clicks a lot and aches) but I’m stronger elsewhere. I can now do five chin-ups and am aiming for ten by the end of the current Jetts eight-week challenge. Photo: My new gym where I’m training to do chin-ups! My injury, surgery, recovery is all my journey. It’s been my experience and no-one can understand it like I do. Through talking with many people while working on my Recover from Injury initiative, I realise that a lot of people struggle to focus on themselves enough to enable them to heal and grow stronger through their recovery. This is especially the case with women, who often tend to be the ones who give, give, give to everyone around them. Taking the time to focus on me is a key thing that I now advocate when I talk with those that are recovering from injury. Being able to adapt after trauma is a complex set of skills and strengths. Having resilience is something we don’t really cultivate in Australia. There’s a tendency to brush things off with ‘She’ll be right mate!’ attitude. What’s clear is that this isn’t enough. Building true resilience takes effort and patience. But I believe adding this asset to our kitty to draw on when life throws us curve balls is a valuable pursuit. After injury — and again after surgery — I was confronted with needing to accept a different timeline for… well… everything. Going from being an active, independent person who could run up and down stairs without thinking and getting in and out of a shower in a flash… to then being an invalid was challenging to say the least. Every movement, every day was an ordeal. So I reframed what I could get done in an hour and a day. And once I did that, and accepted the change, I could get on with what I could. Everything became easier and I adapted to the ‘new normal’. Now, when I have days that don’t go to plan (often the case as a self-employed person), I remind myself that I am lucky to have as much energy as I do and that I can only do what I can do. Plus tomorrow is a new day! Photo: Learning to take each moment as it comes, including sometimes having to accept that work will be disrupted for a while thanks to this character. I’m more grateful for what I can do now, and I reflect daily on what I couldn’t do a few months ago that I now can. I believe that it is by being grateful for the little things that contentment can creep back in. Even a year on, I am grateful for being able to walk on uneven ground and to travel overseas. For being able to get in a car easily. For being able to sit on a chair with an hour going by without feeling stiff and in pain. I drew on the support networks around me in family and friends. These relationships and the support given is something I now value even more. People have my back and I will be there for them when they need me. My surgeon and physiotherapist were worth their weight in gold. And I will be forever grateful for their care. I know, however, that many people do not have great health professionals by their side. Through major challenges, like injury or surgery, there is a space where we uncover true connections with other people. The love and support I have had from people — some I’ve only met through Facebook groups — has been humbling. Overall the year since my surgery has been a humbling experience and while it’s true some would say I’ve lost things (physically, emotionally, financially) I’ve also gained a range of new strengths and a deeper appreciation for the love we humans can give each other. Photo: Scrambling among temple ruins in Cambodia. This is an adapted version of the article originally published at www.recoverfrominjury.com on May 25, 2017. Recover from Injury provides a range of articles and resources online, coaching and an online community through Facebook so that members can help each other through recovery so they can thrive again.